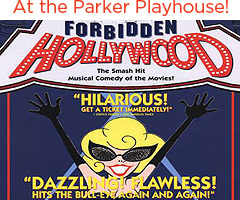 The Broward Center for the Performing Arts’ 2011-2012 Off-Broadway Series presents Forbidden Hollywood, on Sunday, March 11 at 2 and 5 p.m. at Parker Playhouse. This smash hit musical comedy of the movies, from Forbidden Broadway creator Gerard Alessandrini, keeps the tinsel town parodies topical by constantly updating the material so that classics and new blockbusters stand an equal chance of being skewed. Forbidden Hollywood comes hot on the heels of its long-running predecessor, Forbidden Broadway, with guns blazing and smokin’ with attitude. Fast paced and furious, Forbidden Hollywood cuts through Tinseltown’s bombast and starpower with surgical precision. Recent classics like Titanic, Star Wars, Harry Potter and Austin Powers all receive the comic once-over from Forbidden Hollywood’s cast. The bigger the production, the harder it falls. The cast revels in its wicked destruction of blockbusters like Shrek, Lord of the Rings, and Chicago. The Parker Playhouse is located in Holiday Park at 707 N.E. Eighth Street in Fort Lauderdale and is managed and operated by the Broward Center for the Performing Arts. Tickets are $35, and are available at (954) 462-0222. You may select your seat online at www.parkerplayhouse.com. Tickets are also available for purchase at the Parker Playhouse Tuesday-Saturday from noon to 5 p.m.